Colours must have names. The assumption that colour identification can itself be the foundation of a colour system is therefore justified. Accordingly, between 1955 and 1976, the Americans K. L. Kelly and Deane B. Judd attempted to reduce colours into increasingly fine blocks, and then fill these blocks with still more finely defined terms for colours. The central illustration shows the block separation — in this case applying to the purple segment — commissioned by the Inter-Society Color Council (ISCC) for the National Bureau of Standards (NBS) in Washington. The adjectives used in this particular example are the same as employed for all other colours: vivid, brilliant, strong, deep, light, dark and pale. It is apparent that the terms «bright» and «dark» are only used near the neutral black-white axis, and not in regions of high saturation. 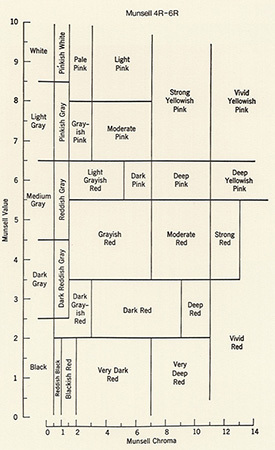 Kelly and Judd used the three parameters of hue, value and chroma to define the colour blocks which subdivide their colour-solid, just as the American A. H. Munsell had done at the beginning of the 20th century. 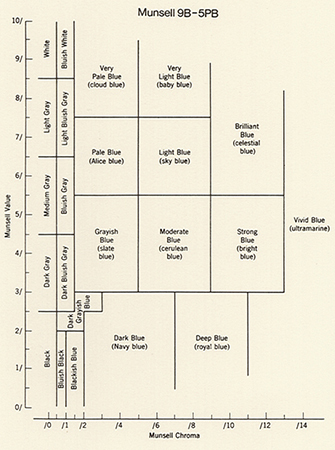 The actual colour names have been selected independently from Munsell’s system, as is evident from both the outer illustrations. The descriptive terms chosen for the various segments chiefly show the subjective variables of the phenomenon of colour which emerge when a colour is held in front of the eye for an extended period. It is evident that Munsell’s red gradation, classified as R4/14 (left-hand diagram) is identified as being just as «vivid» as the corresponding ultramarine-blue (right-hand diagram), although they were both certainly of varying brightness. Obviously, vividness is regarded as a significant parameter, alongside depth, strength and brilliance. Every attempt at ordering colours according to language must be viewed sceptically when neither the ambient conditions of observation nor the experiences of the observer are able to be taken into account. It is therefore no surprise that the generic system shown here has received little recognition. Naturally, the link between language and colour not only awakened the interest of colorimetry experts; it also attracted the attention of linguists and philosophers of language, a fundamental question being whether thought determines language, or the reverse. Any answer will depend on the feasibility of observing language and speech as separate entities. Of prime importance here, however, would be to obtain data on thought which is uninfluenced by speech. This could be achieved in the case of colours, because we can examine how a human being divides up the spectrum of a prism without having to ask him, and therefore without resorting to language. Additionally, we can see if different languages apportion the visible spectrum in different ways. Since the fifties, linguists have occupied themselves with this question, the present consensus being that our perception gives the spectrum its structure, not our language. Language only duplicates — more or less completely — the differences set by our universal perception. Besides, our recognition of a colour does not depend on whether we have a descriptive word for it. Another interesting discovery was made during these investigations: the two American linguists Brent Berlin and Paul Kay established that not all languages possess the same number of basic colour names. A basic name was assumed to be a short word which was neither separable, nor usable as a description of a material. Yellow and green thus count as basic names, but not dark yellow or turquoise. Of almost 100 different languages investigated, none had less than two or more than eleven such basic names. More exact evaluation reveals how the corresponding colour vocabulary of a language appears to conform to a certain sequence: if a language only has two colour words, these will be black (or dark) and white (or bright); red will always be the first chromatic word to be found in addition to these two; the fourth basic name is then either green or yellow; a language with five expressions for colour exhibits the sequence black, white, red, green and yellow; blue appears only in sixth place, with brown seventh. 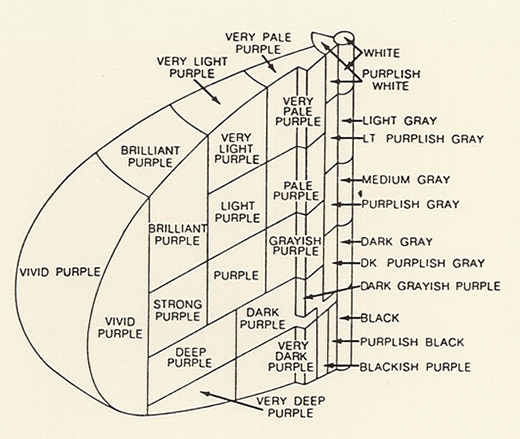 Up to this point, there has been a specific hierarchy; beyond it, colour vocabulary is supplemented by the quartet of violet, orange, pink and grey in an arbitrary way. Paul Ray suspects that, with this structure of vocabulary, a sequence becomes visible which conforms to the way in which humanity built up colour terms. Although red was not necessarily the first colour seen by our ancestors, the colour of blood would have been the most important colour with regard to our survival. From the excitement and reaction which red can still evoke, perhaps this idea is not so easily ignored. Date: In 1955, the Inter-Society-Color-Council (ISCC) recommended the classification of colour names at the suggestion of the National Bureau of Standards (NBS). Bibliography: K. L. Kelly und D. B. Judd, «The ISCC-NBS Method of Designating Colors and a Dictionary of Color Names», National Bureau of Standards (USA), Nummer 553 (1955); K. L. Kelly und D. B. Judd, «Color Universal Color Language and Dictionary of Names», National Bureau of Standards, Spez. publ. Nummer 440 (1976); F. T. Simon, «Color Order», in F. Grum und C. J. Bartleson, Optical Radiation Measurements, Volume 2, Color Measurement, New York 1980, pp. 165-235.